The other day I caught up with Sheena. You might know her from a short video interview we made earlier in 2018. That video has been viewed a remarkable 8,400 times on Facebook, which just proves that you need don’t need a fancy production to capture people’s minds. If your story features a compelling personality with a fascinating story to tell then you can’t go far wrong. And that was certainly the case with Sheena. In the video she recalls how her drink problem led to a mental breakdown. The breakdown led to her not opening post and falling behind in her rent payments. She was evicted and, at her lowest point, slept under a bench in Wythenshawe Park. Not surprisingly, it took her a while to get her life together. She was officially homeless for three years. Coming to Back on Track was a major turning point. She took our health and social care course and that turned out to be the start of a new career in care work. Sheena’s story is really inspirational because it shows that what may seem impossible, can actually happen. That’s mainly down to Sheena’s amazing resilience and determination, along with the right support being available. Sheena has now moved on to another job – with Mencap. She applied online to be a relief support worker, and has been going through a series of training sessions with all the other new recruits. The training has included medication, first aid, risk assessments, manual handling, and Sheena has been unfazed by all of it. She loved trying out CPR, and finding out how defibrillators work. When she’s a fully trained relief support worker Sheena will be supporting a woman with learning disabilities. As well as caring in the home she’ll be taking her out for day trips to local parks and the cinema – things she’d never be able to do on her own. 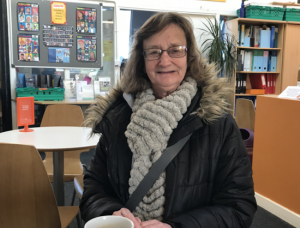 ‘It’s lovely to be able to bring some joy into someone’s life’, says Sheena. And it’s lovely for us to see that Sheena just keeps on achieving amazing things!